Zebra Stripes on Potato Chips? No Way. 5.4 billion pounds of potatoes are used to make potato chips in the U.S. every year. 50% of the potatoes grown in the U.S. come from the Pacific Northwest states of Washington, Oregon, and Idaho. 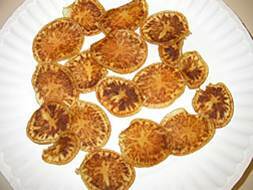 The first appearance of a new potato disease known as “zebra chip” in the Pacific Northwest in 2011 caused great concern. The bacterium that causes zebra chip is transmitted to potato by an insect, the potato psyllid which transmits the bacterium within hours of colonizing a potato plant. Thus, psyllid controls must begin immediately upon detection of the insect in a field. The disease is not harmful to humans when they eat a potato chip, but the bacterium discolors the chips making them unmarketable. In regions where zebra chip has been a problem (Texas, New Zealand, Mexico, Honduras) entire fields have been abandoned. Affiliation: Field Editor, Potato Country. Title: Zebra Chip Strikes Pacific Northwest. Publication: Potato Country. January 2012. 28-31.